Need a festive and easy Valentine’s Day recipe? 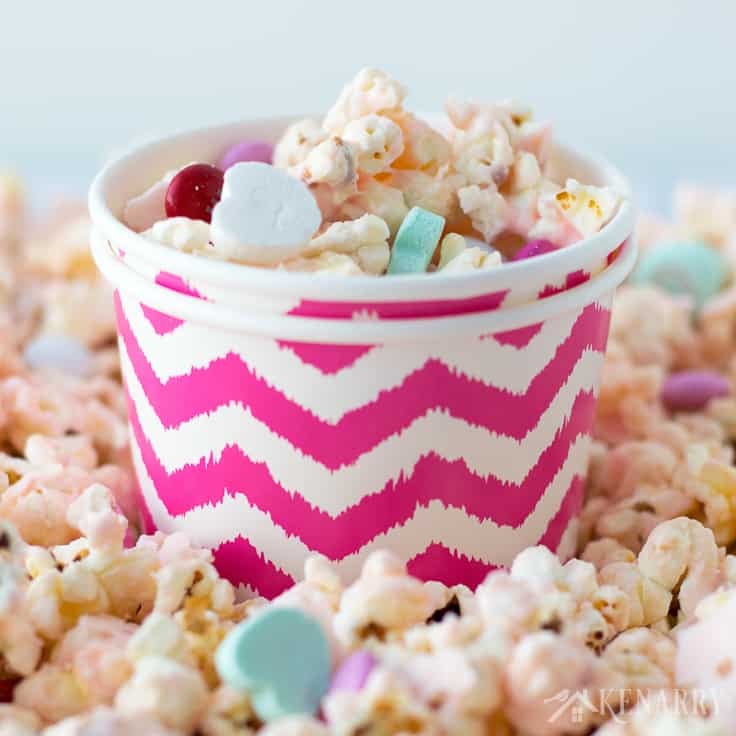 Cupid Popcorn is a fun and delicious treat idea. Make it with your kids to enjoy as a family or bag it up to give as valentine gifts to friends, neighbors or school classmates. 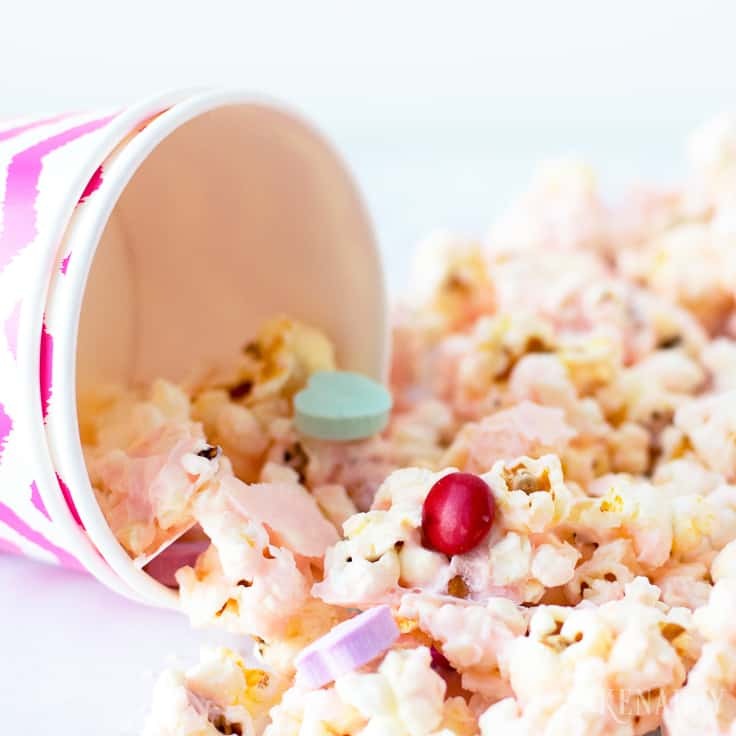 Get festive for Valentine’s Day with this easy Cupid Popcorn recipe. It’s the perfect sweet and salty treat to make for the ones you love. I love creating fun and festive food with my boys especially for different holidays throughout the year. Every year for Valentine’s Day, I try to make heart shaped pizza and brownies for example. Basically when it comes to this season of love you can’t go wrong with any food, desserts or treats that include red, pink and festive heart shapes as far as my boys are concerned. 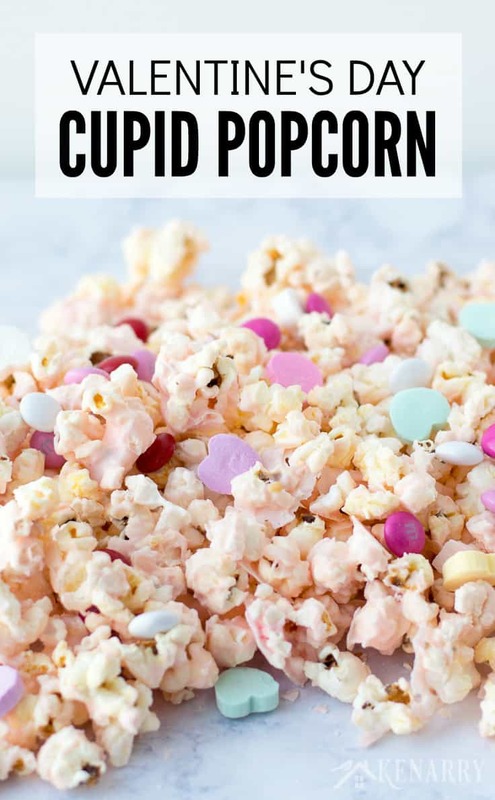 With that in mind, I just know the boys would love this easy recipe for Cupid Popcorn that I got from my friend and colleague, Meaghan at Cook. Craft. Love. Meaghan is very creative and always has the best ideas for easy holiday recipes like her Classic Red Velvet Cupcakes, her Dark Chocolate Raspberry Whoopie Pies or her Conversation Heart Sugar Cookies. So I was super excited when she shared her Cupid Popcorn with us for Valentine’s Day. 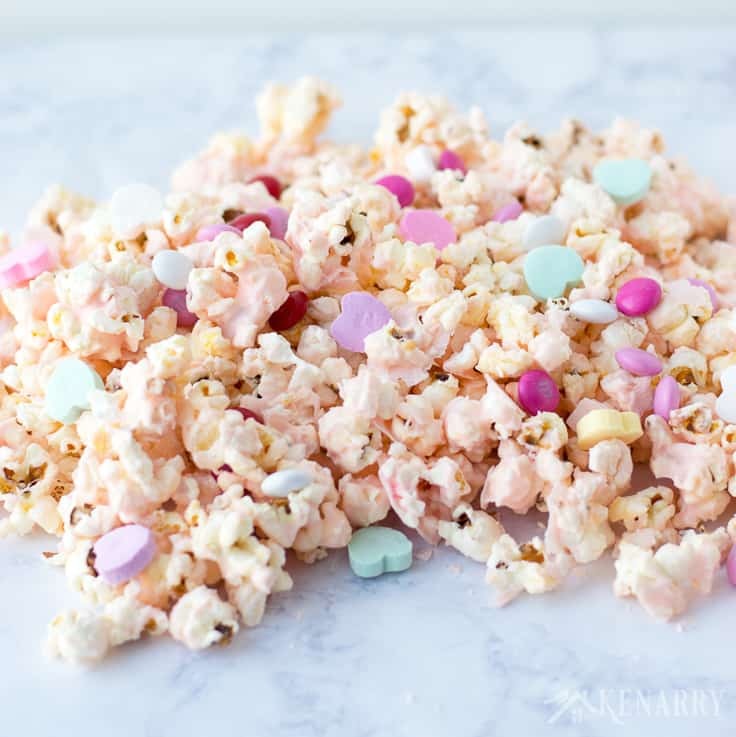 Making Cupid Popcorn is a fun and festive Valentine’s Day treat you can make with the kids. You just need a few simple cooking supplies and five basic ingredients. Place the popcorn in your microwave following the instruction on the popcorn bag. Once the popcorn is done popping, you can remove any unpopped kernels by making a very small opening in the top of the bag using scissors. Then hold the bag upside down and shake it until the unpopped kernels fall out. Put the popcorn in a large mixing bowl. Melt the white chocolate chips in a microwave-safe container for about 60 seconds. As you do so, take it out and stir after 30 seconds. Then stop and stir the chocolate every 10 seconds until it’s completely melted. Be very careful not to overheat the chocolate. Otherwise it will seize up and turn into an unusable clumpy thick paste. You want it to be nice and smooth to pour over the Cupid Popcorn. Next add gel food coloring to the white chocolate until it reaches your desired shade of pink. Then pour the melted chocolate over the popcorn while it’s still warm. Gently fold the chocolate into the popcorn until it’s evenly coated. Be very careful not to break or crush the popcorn kernels as you stir. 4. Add candy and allow the Cupid Popcorn to set. Spread the chocolate covered Cupid Popcorn in an even layer on a piece of parchment paper. You can either do this on a metal baking sheet or place the parchment paper on your counter top. 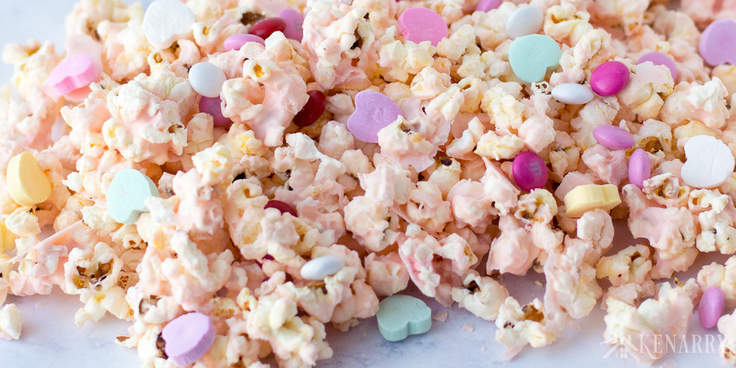 Before the chocolate sets, sprinkle the Cupid Popcorn with conversation hearts and Valentine’s Day M&Ms. Allow the Cupid Popcorn to set for at least one hour until the chocolate has hardened. 5. 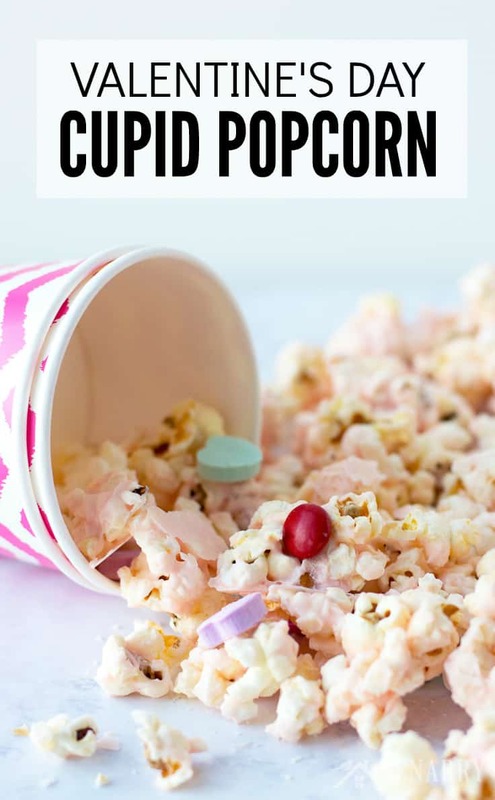 Serve or store the Cupid Popcorn. Once the chocolate has hardened on the Cupid Popcorn, separate the popcorn kernels a little if necessary. You can serve and snack on it immediately. Or store the Cupid Popcorn in an airtight container for later. You could also bag it up and give it as Valentine’s Day gifts to friends and neighbors! Pop the popcorn in the microwave and remove any unpopped kernels by making a very small opening in the top of the bag, holding it upside down, and shaking until the unpopped kernels fall out. Add popcorn to a bowl and melt chocolate in a microwave-safe container for 60 seconds, stirring after 30 seconds, and then stirring after 10 seconds until completely melted. Be careful not to overheat and seize the chocolate. Add gel food color to the white chocolate until it reaches your desired shade of pink and pour over the popcorn while it's still warm. Gently fold the chocolate into the popcorn until it's evenly coated, being careful not to break popcorn. 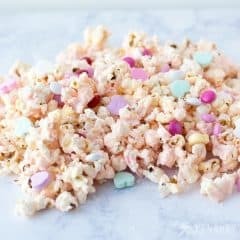 Spread popcorn in an even layer on a piece of parchment paper, sprinkle with conversation hearts and M&Ms and allow to set for at least one hour. Separate if necessary and store in an airtight container or bag it up and give it to friends and neighbors! 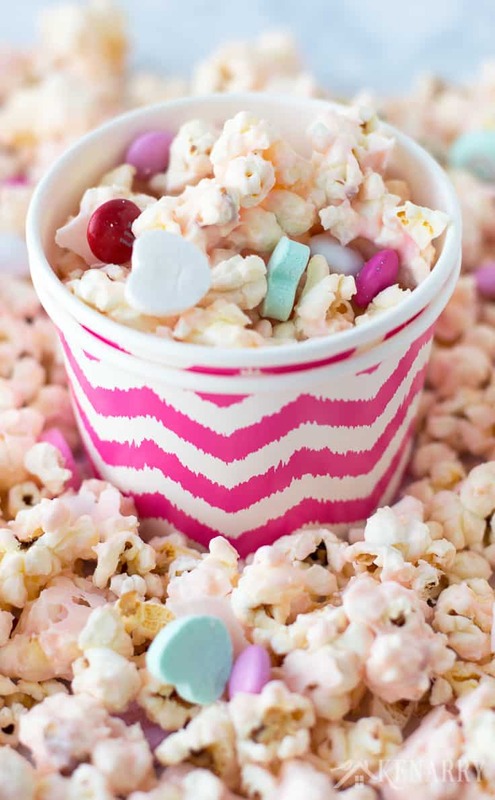 Use red sprinkles and pink sprinkles to add a little more festive color to the Cupid Popcorn. If you’re bagging up the popcorn to give to friends and neighbors, use colorful ribbons and attach a Valentine’s Day card. We have several cute ones available for free when you sign up to be a Kenarry Idea Insider, like these Valentine gift bag toppers or these funny Car Valentines. 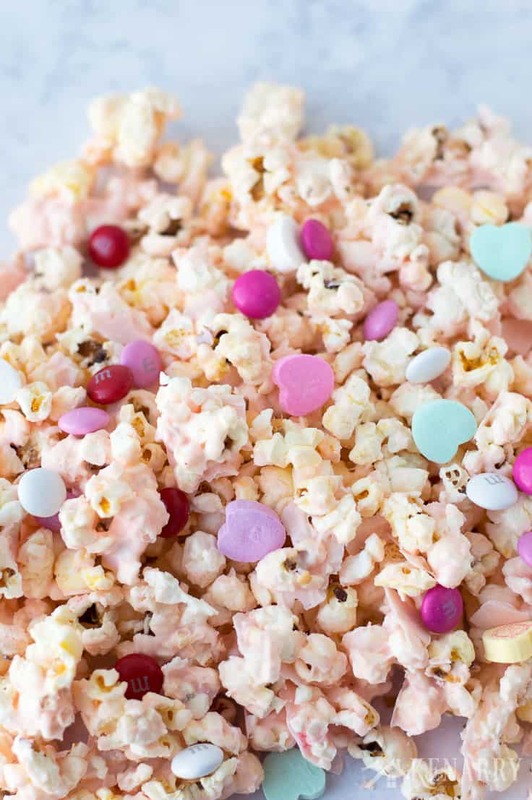 How else would you decorate or serve this Cupid Popcorn for Valentine’s Day? Please comment below and share. We’re always looking for new ideas! So easy to make. A whole lot of yumminess. We’re so glad you enjoyed it, Donna! Happy Valentine’s Day!